What is the GMAT CAT (Computer Adaptive Test)? Computer adaptive testing on the GMAT. The GMAT quantitative and verbal sections employ computer adaptive testing. Now before we get into what exactly this means, let me just point out the CAT is not used on the integrated reasoning section, and of course, it's not used on the essay either. And so what this means is everything in this video concerns only the math section and the verbal section, not the integrated reasoning section. On the math and verbal sections, your entire section is not already determined when you sit down. What does this mean? Instead, each question you get right or wrong determines the mix of questions you will see for the rest of the section. So for example, suppose you're working for your section, could be other math or verbal. The question that you're going to see for question number 16 is not determined until you've submit your answer to question number 15. Once you submit your answer to question number 15, the computer will know whether you got it right or wrong, and depending on whether that question is right or wrong, depending on whether all the previous questions are right or wrong, whatever that whole pattern has been up until that point of the test, all that determines the question that you will see for question number 16. And if you answered. If two people had identical tests up to that point, but then one of them got question number fifteen right and one of them got question number fifteen wrong, they would see different question number sixteens. As a very rough rule, as you get questions correct, you get harder questions. And as you get questions wrong, you get easier questions. That's the over all pattern, but that's a very, very rough rule. The computer is trying to zero in on your ability level. If you are a very strong student, the computer has to give you mostly harder questions to determine your exact level. If you are struggling, the computer has to give you mostly easy questions to determine your level. That's a general overall pattern but don't interpret this too literally. 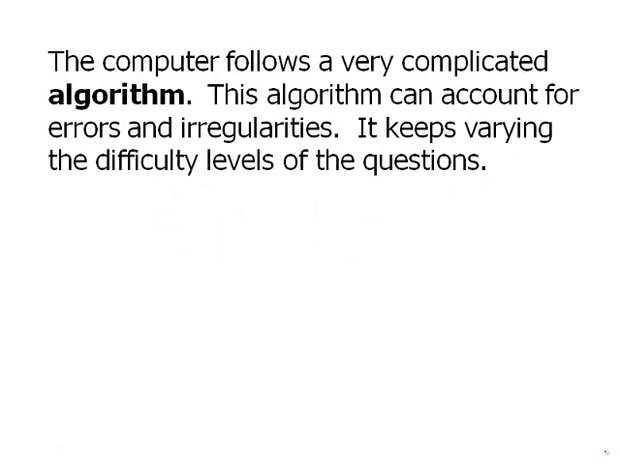 The computer follows a very complicated algorithm. An algorithm is a mathematical pattern. This algorithm can account for errors and irregularities. It keeps varying the difficulty levels of the questions. Do not assume, if you get a question that seems easy, that you got the previous question wrong. This is a big mistake that people make, they learn about the CAT, and when they're in their GMAT, say, qestion number 16 is an easy question and suddenly go into a panic, and they think, oh my God! I got question number 15 wrong! Not necessarily. First of all, keep in mind that just because the question seems easy doesn't mean that it is easy. Maybe it's something that seems easy to you but is puzzling to other people. Furthermore, in fact, maybe it is an easy question but this is not because you got the previous question wrong. The CAT is just sweeping through various difficulty levels as part of it's operation. So if you get an easy question, don't take it personally just be glad. This question is easy, answer, and move on. Don't make any assumptions about what happened on the previous question. Do not try to outhink the CAT. Unless you have a Ph.D in Psychometrics, you probably won't be able to. Another one, in other words, what it is doing is enormously complicated. And so, it's not the type of thing that just casually observing it you're gonna be able to figure out the pattern. The best way to handle the CAT during the test is simply to do your best on each question as it's presented to you. That's really all you can do. So one very important idea to understand here, the CAT has zero implications for your behavior during taking the test. As, as far as test taking strategies, the CAT is irrelevant. The best you can do, according to the CAT, is what you do anyway, just each question you get, do your best with that question and then move on. That's all you can do. The CAT has important consequences for scoring. If two people of different ability levels take the GMAT, they may seem mostly questions of entirely different difficulty levels, and yet, through the magic of advanced Psychometrics, the score that results is always fair. You see, in general, your math and verbal scores reflect not only how many questions you got right, but also the difficulty levels of each question you got right or wrong. So in other words, getting an easy question wrong, that doesn't count the same as getting a difficult question wrong. Getting an easy question right does not count the same as getting a difficult question right. The difficulty level of each question is very important to how much that question counts overall in your score. In particular, you can get multiple questions incorrect and still get an elite high score. If you're doing that well, the CAT will throw at you the hardest questions in the question bank. So the, it will throw the absolute monsters at you if you're at the very top end. And so maybe that you get half the questions you see wrong, but still get an elite score. So don't worry about the fact that the questions seem very difficult. If you're doing questions that seem impossibly difficult on the GMAT, that is actually a very, very good sign, because it means the CAT is reaching back for something extra to give you. So in summary. The CAT implies absolutely nothing new about test-taking strategies. Just, once again, whatever question you have in front of you, do your best with it, then move on. Understand that the computer is trying to adjust to your ability level and is doing this following an algorithm that is much more complicated than any of us can figure out. So don't even worry about trying to figure it out. If you want to understand your quantitative and verbal section scores, need to understand the implications of the CAT. And in particular, don't get caught up on just, how many did I get right? How many did I get wrong? That's not the point. Think about question difficulty level.